Project Note: Use only LED lights in this project. Remove Mason jar lids and discard. Apply an “X” sticker to the smooth side of two jars and an “O” sticker to the smooth side of the other two jars. Run your fingers over the edges of the stickers to make sure to prevent seepage. Lay out wax paper (or palette paper) to protect your work surface. 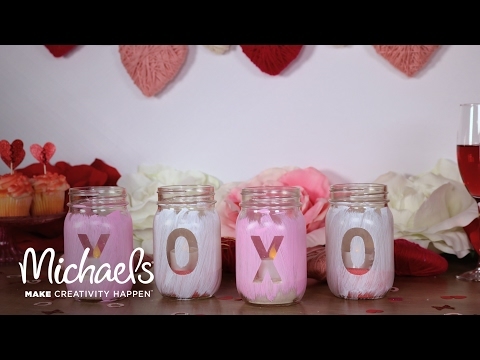 Paint the jars with the “X” with Pink Bliss acrylic paint and the jars with the “O” with Parchment acrylic paint. Let dry. TIP: When painting, use light strokes so the light of the flameless tea light can shine through. Carefully peel off the stickers. Pour about 1" of white granules in the Pink Bliss painted jars and about 1" of pink granules in the Parchment painted jars. Place a flameless tea light in each jar. Allary Ultra Sharp Premium Scissors, 8.5"